PathLab Coding Solutions SM is designed to assist in minimizing risks associated with over-coding and lack of documentation while maximizing reimbursement through proper coding practices. Subscribers will be able to resolve simple to complex coding issues and remain up-to-date with changes in coding procedures by utilizing the Automated Coding Assistant, Resource Center and Coding Consultant Dashboard. To learn more about PathLab Coding Solutions, visit www.PathLabCoding.com �or contact Leigh Polk with PSA at 800-832-5270 ext 2941. (1) We added two new articles to our Management Page - How the New Anti-Markup Rules May Change Your Practice, by Michelle Miller and Mick Raich, Vachette Pathology (click here) and FTC "Red Flags" Rule Compliance, by John R. Outlaw, PSA, LLC (click here). You can also access the Management Page from the center section of our Home Page. (2) We added information on the Hansel stain to the Stains chapter (click here). 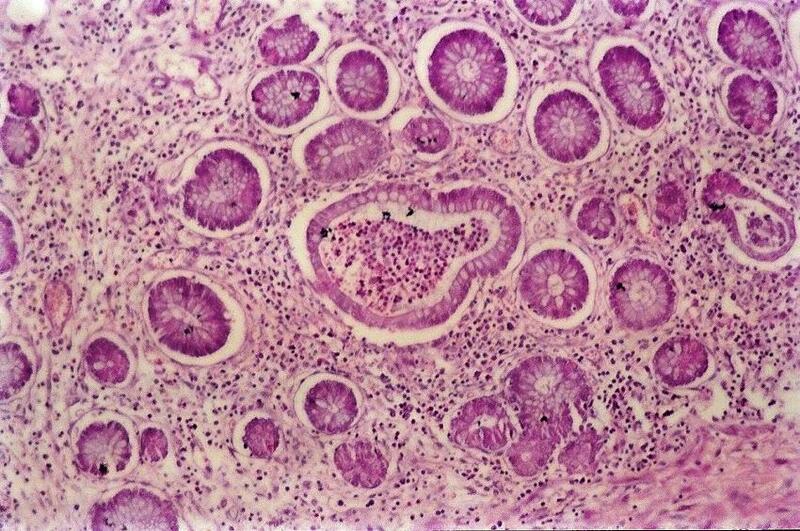 It is used to detect eosinophils in urine. We have reformatted the clinical pathology topics on our Home Page, to make them easier to access. (3) Thanks to Angel Fernandez-Flores, MD, PhD, Hospital El Bierzo and Clinica Ponferrada, Spain, for contributing images to the Skin-Melanocytic Tumors chapter of blue nevus, cellular blue nevus, dysplastic nevus, lentigo melanoma, melanoma-general and nodular melanoma. Thanks to Drs. Mona Kandil, Emad Rakha, Rehab Samaka and M. El Tahmody, and Professor Soliman El Shakhs, Menoufeya University, Egypt, for contributing this case. �To contribute a Case of the Week, email NatPernick@Hotmail.com with the clinical history, your diagnosis and diagnostic microscopic images in JPG, GIF or TIFF format (send as attachments, we will shrink if necessary).� Please include any other images (gross, immunostains, etc.) that may be helpful or interesting.� We will write the discussion (unless you want to), list you as the contributor, and send you $35 (US dollars) by check or PayPal for your time after we send out the case.� Please only send cases with high quality images and a diagnosis that is somewhat unusual (or a case with unusual features). A 40 year old man who was seropositive for Hepatitis C presented with massive rectal bleeding.� Five years previously he had a similar complaint.� There was no family history of any bleeding disorder. A colonoscopy found hundreds of colonic polyps, located mostly in the ascending and transverse colon, with fewer in the sigmoid colon.� The polyps ranged from 1 to 3 cm in length. A total proctocolectomy was performed. 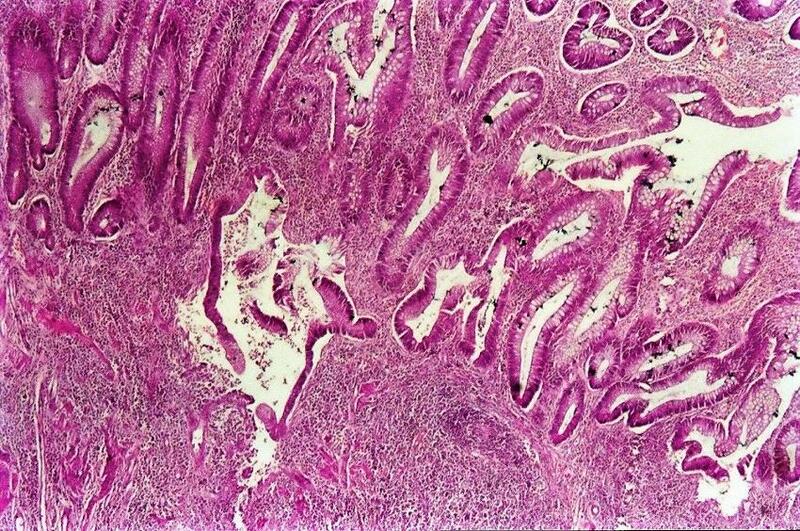 Microscopy revealed multiple polypoid structures covered by branched, elongated glands and cystic crypts, with reactive type epithelial changes.� No definite dysplastic changes were noted.� There were also crypt abscesses, cryptitis, and paneth cell hyperplasia, as well as a prominent lymphoplasmacytic infiltrate.� No granulomas or bizarre stromal changes were identified. This case might also be diagnosed as giant inflammatory polyposis, characterized by inflammation and polyps measuring at least 1.5 cm (Am J Surg Pathol 1986;10:420, Pathol Int 2002;52:318).� It is usually associated with inflammatory bowel disease, although no further clinical information is available in the present case (Arch Pathol Lab Med 2004;128:1286). 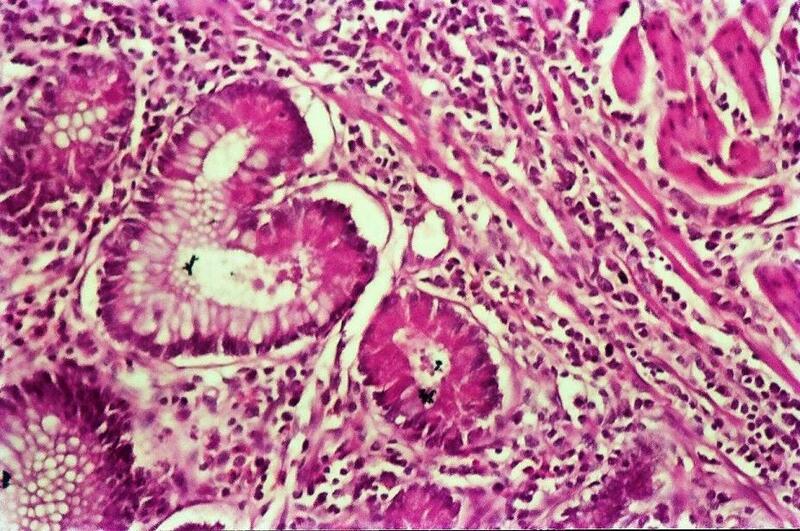 Clinically, the colon in this case resembles familial adenomatous polyposis, caused by mutations in the APC gene.� These patients have over 100 colonic adenomas which demonstrate definite dysplasia, and not just the reactive epithelial changes of inflammatory polyposis (see Colon-Tumor chapter at PathologyOutlines.com). 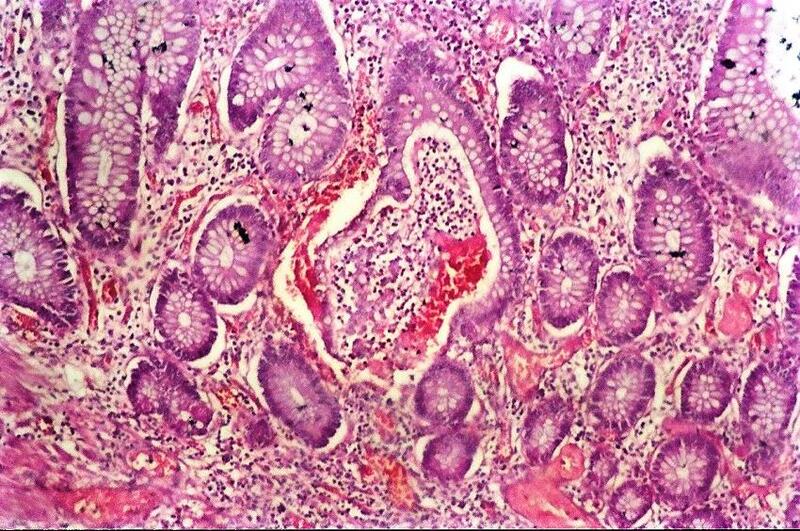 Inflammatory polyps are benign, and by themselves, have no risk of malignant transformation.� However, patients with ulcerative colitis causing the inflammatory polyposis have a risk of dysplasia, usually in flat lesions (see Colon-Nontumor chapter).